Guests admire traditional Acoma pueblo designs related to dry farming and wildflowers projection mapped onto an oversized olla. 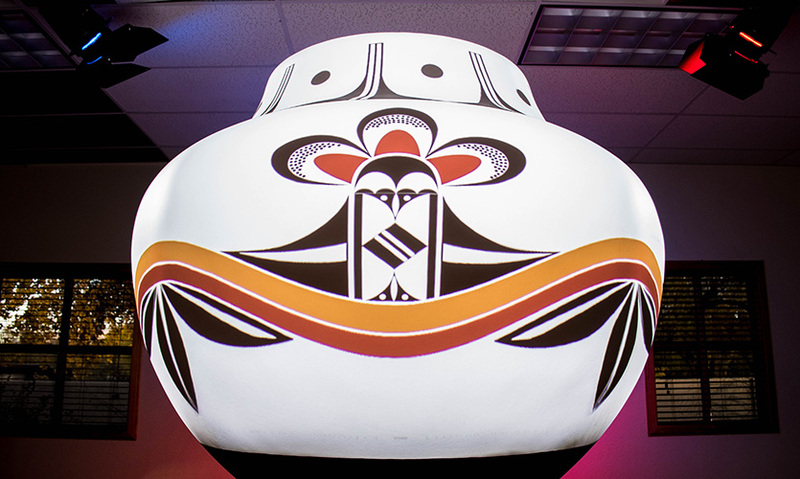 The pot with a 360 projection mapping showing rainbows and raindrops drawn from traditional Acoma pueblo designs. The user interface for controlling the projection map on the pot is a touchscreen on a motorized stand. The pot projection mapped with wildflowers and feathers. The pottery experience was made using a Christie Pandora's Box media server. 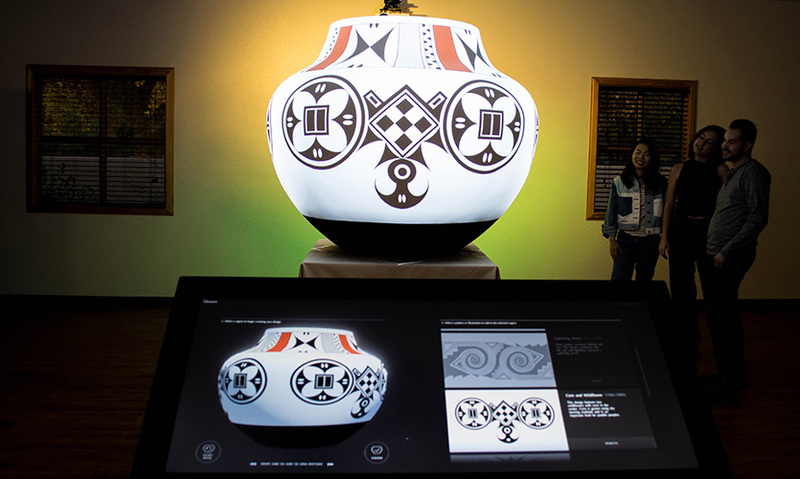 The Exploring Pueblo Pottery project was designed by Ideum to use state-of-the-art technology to allow people to explore traditional design techniques in vibrant new ways and learn about the culture and history behind the images as part of the process. Built to be flexible for a range of public venues, the project uses projection mapping technology and innovative experience design to solve the problem of creating interactive digital representations of three-dimensional sculptural objects. 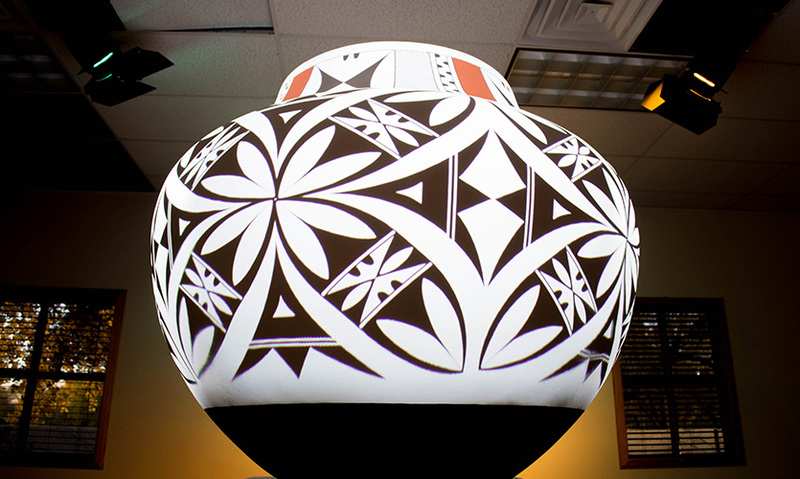 By allowing viewers to experience and manipulate a range of larger-than-life pueblo pottery designs, the Ideum-designed project shines new light on ancient motifs by increasing immersion in the content and making the artworks and cultural ideas more accessible than ever before. Throughout the project, Ideum worked closely with Native American academics and artists to create an experience that allows users to actively investigate intricate native images and concepts and discover how they highlight important elements of pueblo life. A sophisticated 360-degree projection mapping system is at the heart of this captivating experience. Projection mapping generally works best when projecting on planar surfaces in 3D space and although projection mapping has often been used to display content onto curved surfaces, this project offered the opportunity to push the technology further by projecting particularly intricate moving images on a complex curved object. Visitors are active participants in the experience as they use an ultra-wide 34-inch touch display to select patterns and designs. These motifs were crafted by Michelle Lowden, an Acoma Pueblo artist from a family of illustrious potters. The chosen designs are animated and cast in real time onto an oversized white olla, or water pot, by four digital projectors mounted on vertical scaffolds. Viewers then see the blank pot come to life as stylized images of clouds, rain, lightning, mountains, birds and local wildflowers envelop the surface of the pot. And as visitors make selections and create new combinations on different regions of the pot, they learn more about the meaning of the intricate images they are investigating. The Acoma pueblo pottery style is widely known for its fine lines and complex geometry, particularly in motifs related to rainfall. 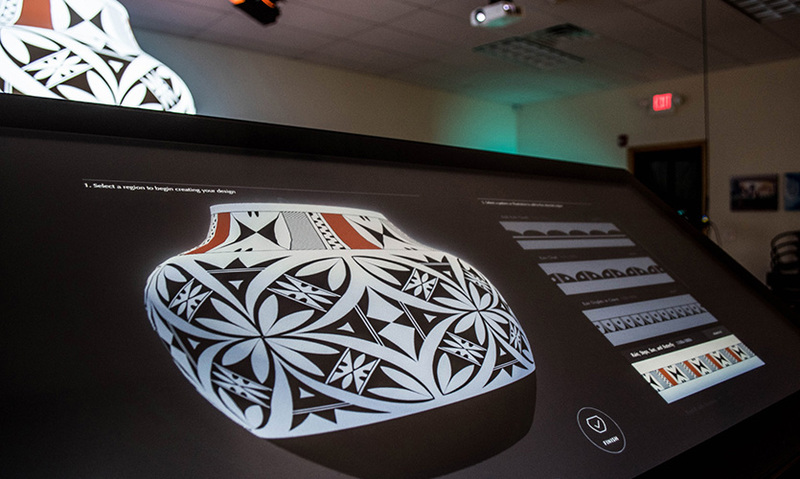 In order to accurately reproduce this complex imagery on a curved surface, our projection mapping team developed a novel approach for combining content creation, image warping and masking to create glowing blended images over the entire surface of the pot. 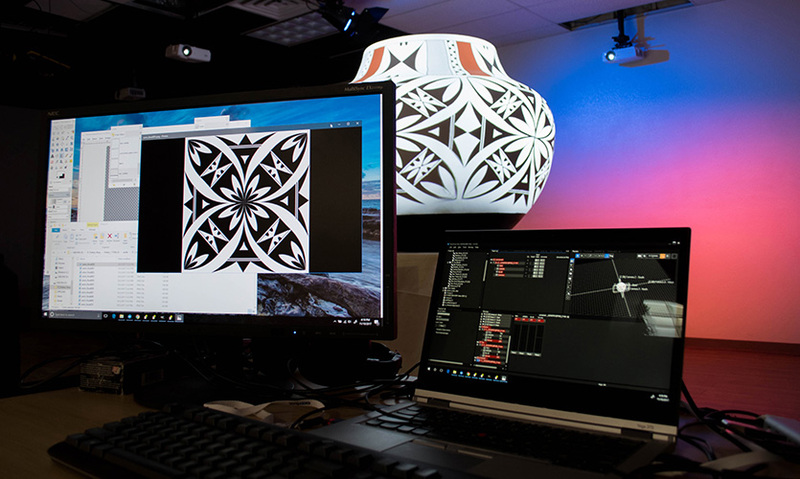 Christie Digital’s Pandora’s Box is the media server behind the complex warping and projection mapping approach. This system also controls LED lights that dynamically change as different patterns are selected. The oversized blank pot itself was created as a 3D model, then formed out of foam on a CNC router. This allowed for a virtual model to be used to accurately align the projectors for distortion-free display on the actual 3D pot. Exploring Pueblo Pottery has received positive mention from numerous clients and partners and led directly to new projects and collaborations. The project’s success in creating sharp seamless animated images on an unusual shape breaks new ground in combining technology, design and history—and presents new opportunities to tell stories about the people and ideas behind timeless artistic traditions. "This installation took an object I might otherwise ignore in a museum and created a dynamic mixed-reality exhibition that both engages and informs me." "It's always great to see the appropriate use of technology. Projection mapping has been around for a while, but this is the first time I've seen it being used in a completely appropriate way to create a really interesting interactive experience. I can't imagine a better use of this type of technology."